Magento – Which Version Is Right For You? Magento launched its V2 in 2015 leaving many webmasters to ponder on site migration or site upgrade. Alan Rowe, web development director at ClickThrough, offers his expert insight into the big site migration debate. The future of Magento could well be here – well almost. Version 2 launched in 2015, and already has a production stable release, while Version 1 continues to issue updates – Magento 1.9.2.2 was released at the end of last year. Every update comes with improvements. However, the arrival of V2 means that ecommerce marketing managers are now faced with the decision of migrating across early or staying with V1 for as long as possible. The web development team here at ClickThrough are specialists in Magento website development, providing website builds and maintenance for small to large-scale ecommerce retailers. As such, we are constantly learning and forward thinking about Magento and how its changes and improvements may affect our clients – both for existing sites and for new web builds. Which Version of Magento Is Right For My Site? Basically, if you are on version 1, the latest version is always right, so we would recommend all ecommerce sites to be working with Magento 1.9.2.2. However, as mentioned, V2 now has a production stable release. There is some discussion around whether new clients should choose the latest 1.9 or migrate to V2. Any existing clients on Magento with a version lower than 1.9 should upgrade to 1.9 in any case, before a migration to V2 can be considered. This could be quite costly and some companies may wish to think about just starting again with V2. However, there is a caveat here. Because V2 is so new, much of the functionality facilitated by third party extensions in the 1.X branch is not yet available in V2. Therefore, companies may decide to wait until V2 is more established. 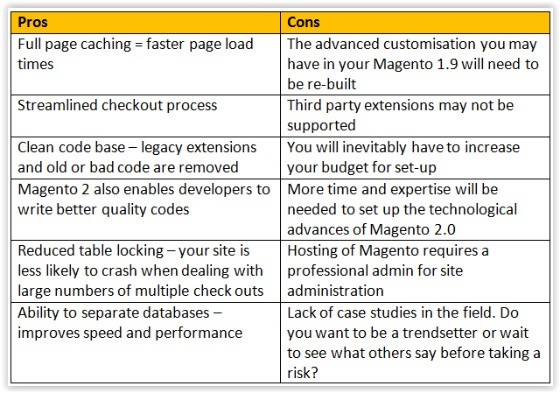 Those companies seeking to create a new website on the Magento platform would need to weigh up the pros and cons of V2. What are the Challenges of Migrating a Site to Magento? Unlike smaller content management systems (CMS) like WordPress, Magento is very complex and the migration process is not simple. Magento is an ecommerce platform, aimed at companies with a digital turnover of more than £100,000 a year. Therefore, the likelihood is that your website will process many transactions per day. As such, you cannot afford to perform the upgrade offline and then switch sites as you will lose new customers and order records for the interim period. If you already have a Magento site, then the work associated with upgrading to 1.9 will depend on what version of Magento you are running. Whether upgrading or migrating to V2, a full audit of all third party extensions will be needed. Ideally, the procedure for upgrade or migration will be trialled locally or on a development server first, followed by extensive testing. We have managed Magento migrations and integrations for a number of ecommerce companies, including Gtech, DHL, Interlink, Sage, SAP and numerous fulfilment centres. Each project is unique and the solution may be bespoke, but our approach is always the same. Our approach is to first map the processes required for any client upgrade or migration and record this. It is better to plan and test all functionality of the upgraded version first, rather than find out after the migration that there are problems. By then, the historical data is lost, the migration takes too long and costs too much. A second trial run is then conducted to improve this process further and write batch automation scripts to streamline the actual roll-out of the new version. During roll-out there is no sensible alternative but to take the site offline and down for maintenance while this procedure is followed. Typically, the roll-out process takes two to eight hours, depending on individual site complexity. This may seem labour intensive and expensive, but when you weigh up the alternative it’s easy to see why migrating or updating is vital to a site’s success. Risks of not migrating include security flaws and outdated server architecture requirements; for example, earlier versions of Magento do not work on newer versions of PHP. Also, newer extension functionality does not work with older versions. This means that you will never be able to upgrade to V2 unless you have upgraded first to version 1.9. Considering all of the above, we offer best practice guidance to all clients in this current Magento limbo, helping to reduce security risks and any unnecessary damage to your site. Magento is a leading digital commerce platform that provides omnichannel solutions that empowers ecommerce retailers and improves online shopping experiences. If you are already using Magento, we strongly recommend you at least upgrade to 1.9 to make full use of its capabilities. For clients looking to build a new Magento site, V2 shows lots of promise. Although not bedded in just yet – it does mark a new era of ecommerce innovation. Are you an ecommerce retailer looking to develop a website that can adapt and scale to meet the challenges of the online market place? Contact our team of Magento website developers today.